WHAT: An apparatus to allow rotation of samples at the focus of the X-ray beam in scanning transmission X-ray microscopy has been developed and used to measure three-dimensional chemical distributions with ~50 nm spatial resolution in 3-d. The sample is polymer latex microspheres in water, with each ~1 micron diameter polystyrene sphere enclosing low density polyacrylate (~2 wt-% of the solid). 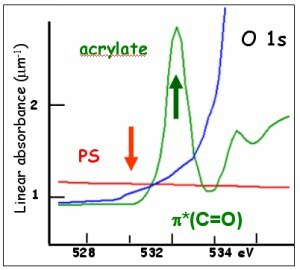 By measuring at 2 photon energies, the difference signal maps the acrylate. The first movie shows a fly through of a rendering of the quantitative 3-d chemical mapping of the whole system, with the water removed. The second movie isolates the signal from the acrylate and displays its 3-d distribution using green for more dense and blue for less dense voxels. This informaiton is useful to Dow chemists optimizing the acrylate filling of these microspheres, for use as a high performance coating component.